Is it unreasonable to expect people to drive at or below the speed limit in our cities? The Oregon House Judiciary Committee passed a bill by a vote of 9-1 yesterday that will give cities the authority to issue speeding tickets to people who are caught on red light cameras. But it only applies to people driving 11 mph or more over the speed limit. Lawmakers and law enforcement officials included that minimum threshold in the bill because they didn’t want the measure to seem unreasonable to drivers. The aim of House Bill 2409 is to address an enforcement gap that exists in Oregon: Red light cameras have speed sensors but the speed data isn’t part of the citation process; and photo radar vans that watch for speeding aren’t allowed to cite for red light infractions. This bill combines those two technologies into one system. 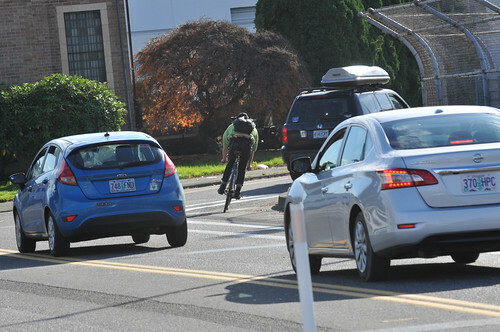 Because of the traffic safety implications, the bill has broad support from law enforcement personnel and it’s supported by the City of Portland’s Bureau of Transportation. PBOT — who operates 11 red light cameras at 10 intersections — sees the bill as a part of their Vision Zero efforts. While the law new will encourage safer and slower driving behaviors, one of its provisions is troubling: People will only be cited if they are going 11 mph or more over the speed limit. While this approach is standard practice from police bureaus (they do it because traffic court judges often side with drivers and dismiss tickets for driving just a few miles over), to ignore this type of unsafe driving behavior in state statute seems like a step in the wrong direction. Especially for a state where nearly 500 people were killed in traffic crashes in just one year. There’s a strange dichotomy at work here. On one hand, our leaders want to improve safety by creating a new enforcement tool. And on the other, they don’t want to cause too much trouble for the people whose behaviors cause the unsafe conditions. Tell people who have lost loved ones from speeding about what’s “reasonable”. According to PBOT (above) there’s four times the likelihood of death or injury when someone walking or rolling is hit by a person driving 30 mph instead of 20 mph. And the risk doubles again from someone driving 40 mph instead of 30 mph. There are major safety implications to driving even 10 mph over the speed limit. Chief Monger and the lawmakers who agree with him are normalizing extremely dangerous behavior. Common practice or not — why one earth would the state endorse driving “double digits above the posted speed limit” — especially while driving through a city? Another provision in the bill says that law enforcement cannot deliver two citations “from the same criminal episode.” In other words, if you are cited speeding, you cannot also be cited for running the red light — even if you are guilty of both (unless your speed is 21 mph or more over the limit). Judiciary Committee member Representative Jeff Barker (D-Aloha) said he likes that provision. A former Portland Police Bureau lieutenant, Barker said during the February hearing that when he was at the PPB it was standard practice to only issue one ticket even if two violations were committed. “We didn’t want to double-barrel people,” he said. Do we want to make streets safer? Or do we want to appear reasonable and friendly to people who are making them unsafe? From here the bill will make a brief stop at the House Revenue Committee before moving over to the Senate. The post Oregon House passes anti-speeding bill that still allows speeding appeared first on BikePortland.org.